Acrylicpress.com wished to assimilate a user-friendly online custom made photoframe designing software and thus sign up No-Refresh. The company also asked for affable custom functionality development for users to acquire desire products. As per the needs and requisites asked by company, we along with our dedicated designers and developers conferred together to comprehend their strategies and implement efficient online photoframe customized designing software. 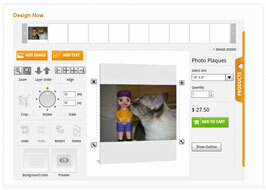 In return, it turns its users to obtain custom made photo plaques, photo blocks, wall art, coasters etc. engraving their desired pictures/images in very expedient way and boost up the trade worldwide. "The service of customized online photoframe design software catered by No-Refresh really benefited us a lot. Since we integrate the tool, our business is flying in the sky and retrieving numerous satisfied customers and make us to sit at peak. The sizable proficient team, business skill and organizational alliance of No-Refresh are literally appreciated." Acrylicpress.com is an exclusive online designing site endowing with entire solution to convey a unique and eye-catchy appearance to your photos and images. With implemented online photoframe custom designing application, the users can obtain various worthy products like Coasters, Dry Erase, Panel Art, Wall Art, Photo Blocks and Photo Plaques by etching their favorite images and photos in desired size devoid of meeting any hurdles and get delivered at their shipping address. Towards endeavor of congregating user’s flexibility the acrylicpress.com speak us to implement a user-friendly online custom designing tool, accommodated with easy and expedient functionality for creating customized photoframe product, where users can encompass their favorite photos and images. In addition, they asked for exclusive and eye-catchy design with vigorous custom functionality development and secured payment option. Out technically efficient team of designers and developers comprehend the company’s entire needs, requisites and trade functionality, towards developing an exclusive site design with easy to follow step-by-step method on sturdy PHP platform. Then, we integrated the online photoframe custom designing software to the site accommodated with desired aspects & attributes for creating captivating photoframe in distinct styles and sizes by users devoid of any hurdles. Following the implementation of the online designing software, the company monitors healthy volume of visitors to their site that take it away at the peak and hit the market worldwide. In the mean time the conversion rate also elevated earning more revenues. The embedded aspects and smooth design add sparkles to its trade transforming as a leading photoframe online business throughout the world. Obtaining desired photoframe of favorite images and photos in distinct sizes and orientation become very expedient and affable with this online photoframe customization tool. It facilitates for custom designing of Photo plaques, Photo blocks, Panel Art, Wall Art, Coasters and others in very easy to follow steps. Merely, select the product, size and upload your favorite photos. Later assign the quantity and purchase directly to get deliver at your door step through secured online payment.